Evernote 8.0 Is Here: What's New and Improved? Evernote 8.0 Is Here: What’s New and Improved? Evernote recently made some pretty significant changes to its iOS app. If you’ve updated to version 8.0, when you open it up, it almost feels like you’re opening up a brand new app. Changes to the app’s user interface, functionality, and speed are all noticeable. The navigation menu in the app has changed with Notes, Search, New Note, Shortcuts, and Account. The New Note button (a green plus button sign) also brings with it several options. If you tap it once, Evernote will create a new standard note. Tapping and holding the button gives users the option to choose between three additional formats: Audio, Photo, or Reminder. Work Chat, the ability to communicate instantly with other Evernote users, has been moved under the account tab. The overwhelmingly, standard green interface has been replaced with a cleaner, default, white interface. Your list of notes is now front and center, rather than your list of notebooks. There are three options for how your Notes list appears. In all options, you can see a preview of the first few sentences of a note or the cover page of a PDF file. You can choose just how much space the preview image takes up with the choice between small, medium (the default option), and large. Tap the menu button to switch between views, and to switch off the images and preview text if you prefer a simpler look. The list of notebooks is now hidden in a drop-down menu at the top of the screen which you can access by tapping All Notes. Tapping the tag button next to the search bar lets you filter your notes by tag. You can quickly switch between notebooks here, with recently changed notebooks featured at the top of the list. You can now search in all notes using the search bar at the top of the Notes tab. You can also search your entire account from the search tab. This will include results from your notes, notebooks, and tags. Tapping the tag button next to the search bar lets you filter your notes by tag. Other changes include shortcuts getting their own tab, where you can also easily find recently viewed notes. You can also switch seamlessly between business and personal accounts from the account tab. Evernote iOS users also now have beefed up formatting options in the app including choosing small, medium, or large text size, and changing your text color. What do you think of the latest Evernote update? Are you more likely to use it now? Let us know in the comments. Been using Evernote Premium for years and have been a big fan. However, this latest update is truly awful in appearance and in performance. Another reason I quit Evernote. New features always come out on Apple devices first. After being unable to open Evernote for 2 days because it crashed on opening and then finding new restrictions to two devices and other things to discourage free users I am done with Evernote. I have dumped everything over to OneNote for now. I may move that to google keep. Haven't decided. Still need to scan business cards with OCR but Evernote was putting restrictions on that for free users. Unless you like paying monthly service fees I recommend you dump Evernote which has been reducing features too and find something better! $3-$5 a month is too much for this service for you, right? I wondered how I missed so many updates since the article read that version 8 was newest....then I realized like everyone else that it's for iOS and not Android! However, I am curious what version of Android everyone else running? Mine is 6.4.2.3788. Donna, mine is 7.9.8 Why are you still on 6.4.2? I wish I knew why I'm not getting the latest update for Android....I checked under "Help--Check for Updates" and get the message "There are no updates available at this time. You are using the latest version of Evernote." Samsung in photo as mentioned in other comments? It would have made more sense to release Android first rather than the Apple niche market. The world is running on 87% Android! They probably release iOS first because that market segment makes them more money. What about users' privacy and security? Do they encrypt notes or connection? Highly miss leading banner photo.... Very disappointing. I apologize for the image confusion. I've fixed it to show the iOS app. 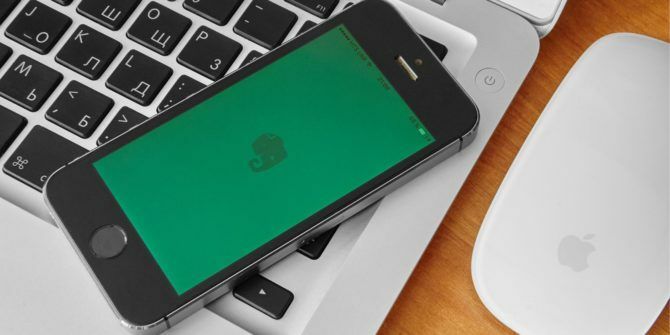 Evernote releases new version on iOS. Thumbnail shows a Samsung. I've been duped. I apologize for this. The image has been fixed.